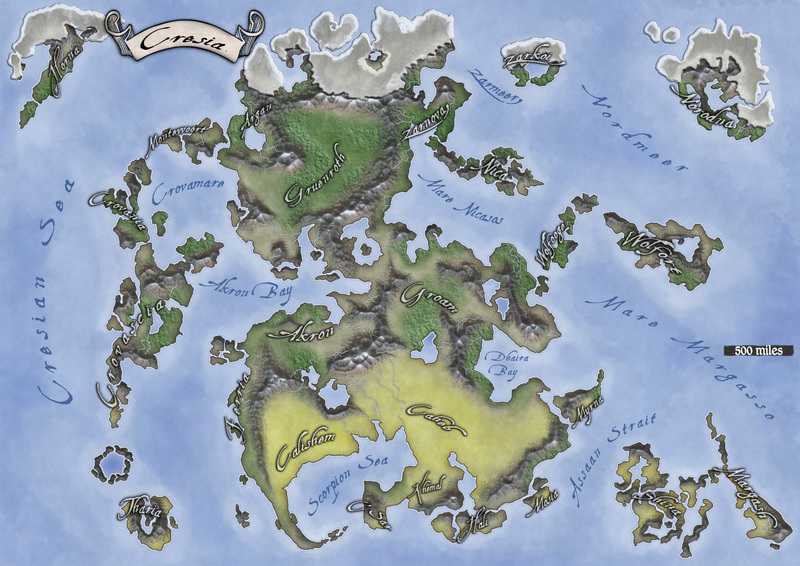 Cresia is a Work In Progress fantasy world setting intended for fantasy role-playing systems. Any and all help in developing and fleshing out Cresia is appreciated and heartily welcomed. All work must be Creative Commons -compliant. Short stories, character ideas, adventure seeds, maps… the aim of this thing is to create a fantasy role-playing environment. Yeah … I know several exist already and why would anyone want to create yet another one. I have no answer to give. I’ve been a game master for over two decades and perhaps I’m just aiming for what I always wanted out of my settings and rarely – if ever – received. Well anyways … I’m going on with this thing anyway. Some of the location names and characters are lifted off from CWBP (Cooperative World Building Project) mentioned in the front page, which is also a Creative Commons endeavor. A continent map of Cresia showing also the countries of the continent. The actual map here is 1754×1240 pixels in size (some 60% of the original I have created). A map of the borders of countries.